This season’s Division III preseason rankings look very different compared to those in the past as a new crop of contenders are quickly stepping up to challenge the perennial powers for national supremacy. It’s no mistake that annual favorites like Birmingham Southern and Emory, as well as teams that reached last year’s D-III Baseball Championship such as Oswego State and Wheaton, are not in this year’s preseason rankings. Neither are six of the last seven schools to finish as the national champion runner-up. Of course some of the favorites are still back, Cortland is going to be Cortland and Southern Maine is always legit. But who would’ve thought a team like Roanoke could’ve reached the final eight and be a title contender when they’d had only a pair of winning seasons in the previous 15 years? Babson too had an out-of-nowhere run as they’d historically been a perpetual middle-of-the-pack team who suddenly caught fire and won 16 of 18 to set a new school record for wins. Furthermore, it was also just a handful of years ago that Salve Regina was floundering with a 14-27 record. Last season they won their second straight Commonwealth Coast Conference championship and established a new school mark for single-season wins. The preseason Top 25 mimics the recent results with a near equal mix of traditional teams and up-and-coming clubs. It’s anyone’s guess if the last team standing this spring will be one of the established elite or a new kid on the block, but what is unquestioned is that is going to be another exciting season of D-III baseball. The Warhawks return six everyday starters from a lineup that batted .318, swiped over a century-worth of bases and out-slugged opposition .468 to .316. Blake Fleischman, the reigning Wisconsin Intercollegiate Athletic Conference Position Player of the Year, is back for his senior season along with Brett Krause and Cal Aldridge, who were nearly (if not just as) impressive at the plate as they combined to bat .361. The player who could have the biggest impact at the plate is Daytona Bryden. He was limited to 19 games last season, but when he was in action he hit .386. In 2016 he topped the team in batting, finishing at .400, and stolen bases with 24. In the offseason the team also added transfer talent in Connor Moroder and Nick Schrader who both started their college careers on D-I campuses. Nevertheless, what really makes UW-Whitewater the team to beat this spring is their sterling pair of starting pitchers, Austin Jones and Heath Renz. Both earned All American honors last season with Renz being named the Midwest Pitcher of the Year. The pair combined to earn the win in 17 games, had sub 2.00 ERA’s and held opposition to a .207 batting average. Michael Kaska excelled in spot starts and out of the bullpen last year and could be the de facto coup de grâce closer should any teams have aspirations of a late-inning comeback. Head coach Joe Brown is anxious for the season to begin as he is ready to compete with a well-stocked club complete with experienced upperclassmen, a top-of-the-line recruiting class and a number of immediate impact transfers that will make another run at the D-III CWS. Senior captain and catcher Justin Teague wields one of many dangerous bats in the lineup and is one of the top professional prospects in D-III. Teague and Jack Massa, who led the team in home runs and RBI, are two of five First Team All State University of New York Athletic Conference players back in the everyday lineup. Some of the most experienced pitchers graduated, but there is another crop of ready arms ready to be harvested. Jake Casey and Andrew Barnes both impressed in mixed roles last season and look ready to take over full time starting positions. However, they’ll have to outpitch Brown’s quality cavalcade of incoming freshman and transfer recruits. With the exception of their final position, Wooster spent the entirety of 2017 deservingly ranked within the top seven teams in the nation. They earned 36 wins, took home their league leading 17th North Coast Athletic Conference and hogged all the top NCAC postseason awards. This season looks like a shoo-in to be a repeat of the last, but for the Scots sake, with the exception of an unceremonious early exit from the postseason. Michael Wielansky is shaping up to be D-III’s Player of the Year as he continues his wondrous college career. Last year he topped the nation in runs and finished in the top 10 in total bases and hits. He also earned national gold glove honors for his near flawless defense. Over the summer he was the Valley Baseball League’s Player of the Year. Wielansky is one of seven everyday players back in the lineup. The pitching staff looks good, although not quite as imposing as the players at the plate. Nanak Saran topped the team in ERA, strikeouts and had an 8-0 record last season but is the only pitcher back who started at least five games. Nonetheless, Wooster’s overall situation on the mound doesn’t seem to be a concern with a wealth of arms available to take over. The explosive Gent offense, which batted .347 as a team and scored 401 runs, returns six of nine everyday starters including pro prospect Chris Zapata, who hit .391 with 17 doubles, 12 home runs and 71 RBI. Each of Centenary’s top four pitchers will be back, two of which earned 11 wins for a combined 22-4 record and accounted for 183 quality innings between them. Also back is All Region rubber-armed reliever Cole Lavergne who compiled 60 innings in 20 appearances. While on the mound he walked only eight batters while amassing 54 strikeouts. Head coach Mike Diaz also has three top-shelf freshman arms on campus that he anticipates will battle for spots in the rotation. The Cougars had an incredible postseason run last year, sweeping through the Northern Athletic Collegiate Conference tournament as well as the Midwest Regional to earn the team’s first trip to the D-III World Series. CU is an unquestioned favorite to make the trip north to Appleton once again and are a virtual lock to win their sixth consecutive conference title as they welcome back seven players who earned all-NACC honors, as well as Andrew Massey, who sat out last year due to injury but led the NACC in batting average and doubles in 2016. Massey and Bryan Van Duser, who let CU with a .418 average and had 20 extra-base hits and 19 stolen bases, will be the sparks for an explosive offense. Head coach Mike Stawski has an embarrassment of riches on the mound with his regular rotation back as well as a handful of relievers that earned the club a 3.69 team ERA. The Hornets will be without their three best batters from last season, but have a dominating pitching staff that will be one of D-III’s best. Colin Moree, Gerald DePhillipos and Michael Bugonowicz all had sub 2.60 ERA’s and were on the mound to start 27 of Shenandoah’s games last season. While all three are impressive, Morse is a future SU Hall of Fame lock as he’s gone 19-2 while on campus and has struck out 181 batters in 200 innings with a 2.52 career ERA. The offense probably won’t score as many runs as last season, when they crossed the plate over seven times per contest, but they still should have plenty of firepower with three legitimate All American candidates in the lineup. Chase Rowe believes this team could be the best he’s had in his baker’s dozen years as the ‘Hawks head coach. The core position players were all major members of the 2016 team that advanced to the final four of the 2016 D-III National Championships and they’ll mix with a top-shelf recruiting class that developed on the coattails of that success. Rowe has high aspirations for Tre Thomas as he struck out 31 in 28 2/3 innings last season but has room for improvement as he also walked 23 to inflate his ERA. While he continues to develop the team can continue to lean on established starters Regis Sauer and Nick Tunstall who went a combined 13-2 last season. Johnathan Spina could be the team’s breakout performer on offense. As a freshman he only managed a .115 batting average. Last season he hit .400 in 33 starts. Last year’s Comet club compiled a 33-11 record despite having only three seniors on the roster. Consequently, many of the players from that winning club will be back looking to take the team to the next step and ensure that they won’t be overlooked when postseason bids are handed out once again. Barry Casey is one of six players back who had at least 100 at-bats and hit over .380. He also paced the team with eight home runs and 54 RBI. UTD also returns their four best pitchers who combined to earn 27 of the team’s 33 wins with only three loses among them. Jamie Andriot posted the most impressive numbers of the lot, earning first-team All-ASC honors by setting a new team records with his 10 wins along with a 2.70 ERA and 80 strikeouts. The defending champs have no intention in giving up their crown with an experienced roster that knows how to win. Knocking the Kingsmen from their throne won’t be an easy task as the CLU pitching staff will be anchored by Nate Wehner who earned 10 wins last season, pitching 110 2/3 innings with a 2.68 ERA and four complete games. He’ll be reunited with Troy Frazier who led the team in ERA as a freshman in 20 relief appearances. That tandem will welcome Christian Slattery who’s looking to take over the closer role after a season impressing at LA Pierce College. Max Weinstein wielded the most valuable bat last season and will once again. He hit .384 with 20 extra-base hits and will pace a determined, dynamic offense intent on finishing first once again. The Beacons will be a team to beat who look extremely solid on both sides of the ball. The starting rotation will require some players to step up and replace a pair of arms, but overall the staff is very deep with five capable relievers back in the bullpen. One likely remedy will come in the form of J.T. Morin who missed most of last season but made nine starts in 2016 as a freshman and topped the team in strikeouts. Another player looking to resurrect success before sitting out due to injury is David Murphy. Two years ago he had a big season for the Beacons, slugging .599 with a .316 average in 46 starts. He’ll be part of tremendous trio that also includes Kyle Boudrais and Chris Fowler, who batted .368 between them and combined for 198 total bases. Last spring SJFC ended their season with 31 wins and their second straight NCAA postseason appearance to continue the Cardinal’s ascension into D-III baseball’s elite. With the returning Empire 8 player and pitcher of the year, head coach Brandon Potter has reason to be optimistic that his club will be making its second trip to Appleton under his direction. Scott Eisenmenger topped the team with a .381 average last spring and was fourth in D-III in RBI with 59 as he set the school record for home runs with 12. He’ll be backed in the lineup by three other regular returnees along with Jake Hewitt, who vamoosed from Cortland and could develop into a major presence in the batting order. Anthony Brophy, earned a 9-1 record on the mound, holding opposition to 1.54 runs per nine innings despite being just a freshman. He’s just one of two seasoned starters back who have an abundance of support in the bullpen to keep them fresh deep into the season. The Cardinals had a spectacular season last spring, as they earned their third consecutive College Conference of Illinois & Wisconsin regular season championship, took home the CCIW tournament title and advanced to the D-III CWS for only the second time in school history. That impressive outcome is likely just the start of something bigger and better for NCC as head coach Ed Mathey’s team is poised for another monster year. Offensively the Cardinals have two of their top three hitters back on campus capped by All American and CCIW Player of the Year Michael Mateja who hit .394 with 26 extra-base hits and 22 stolen bases. The Cardinals also added Mike Wisz via the University of Houston to fill out the order. The NCC staff doesn’t have any big statistical performers on paper but can tout a solid bullpen which will keep games from getting out of hand. The Huskies had another successful season last year finishing the season with a 34-13 record overall and a 12-2 mark in the Little East Conference. A spirited postseason run saw them come one win away from earning their ninth D-III National Championship series appearance, but they couldn’t get by stalwart Oswego State in the regional. Head coach Ed Flaherty, who incredibly has never had a losing season in his 32 years at the helm, will again be closer to finishing in Appleton than he will a .500 mark. This year’s offense looks particularly sharp with three batters back who started at least 40 games and hit over .355, topped by Dylan Hapworth, who not only hit .394 but added 14 doubles, four triples and nine home runs. The starting pitching isn’t imposing, but does benefit from having Jake Dexter, who was fourth in the nation with 12 saves in the bullpen. The Maroons crushed the school season record for wins last season, upping the mark all the way from 23 to 35. That remarkable increase included RC’s first Old Dominion Athletic Conference title, a South Region championship and a pair of wins at the D-III National Championships. With those accomplishments it’s hard to believe that it was just three years ago that the school finished with a winning record for the first time. Continuing last year’s winning ways won’t be easy with some major cogs missing from this year’s machine, but there are still plenty of tools around the diamond for another successful season. The top three hitters are back in the dugout, led by Sean Guida, who hit .339 with eight doubles and 10 triples. The Maroons’ pitching staff doesn’t have an ace this season but they didn’t really have a dominant arm last year either. Instead it appears head coach Matt McGuire may again manage his stocked staff with a starter- and closer-by-jury approach, which worked well last season when 11 different pitchers started games and nine earned saves. The Tommies team will be looking to earn their eighth Minnesota Intercollegiate Athletic Conference regular season title in nine years under head coach Chris Olean, who won’t need to replace much talent from last season’s roster. In fact, he believes that instead of filling in holes left by departed players he was able to upgrade position players in terms of both quality and depth during the offseason. STU’s success will depend in large part to a superior starting staff with the three-headed hound of Henry DeCaster, Drew Molin and Ryan Zimmerman on the hill. Last season the trio struck out 244 batters in 215 1/3 innings while only allowing 50 walks and 198 hits. The offense looks legit as well with some formidable bats back along with transfer Ryan Lust, who hit .410 with 20 stolen bases at nearby Anoka-Ramsey CC. Alvernia earned an at-large invite to the NCAA championships where they played well but were doomed by two ill-fated innings, which cost them a pair of games and resulted in their elimination. The newly re-named Golden Wolves will be led once again by All American Nathan Sides who has rewritten the school record book during his time at AU. Last season he was in the top three in seven offensive categories in the MAC Commonwealth and won conference player of the year honors after hitting .433 with 14 doubles and six triples as the team’s soft-handed shortstop. The Wolves also have three of their top four starting pitchers back, capped by John Catchmark, who was the MAC Commonwealth Pitcher of the Year. After a deep postseason run which saw them get eliminated by eventual national champion Cal Lutheran, head coach Tom Boggs justifiably has high aspirations for his team in 2018. Bret Leiferman is a force on offense and is one of four everyday hitters back who batted at least .330. Leiferman topped the team in batting last season, hitting .390 with an impressive 18 doubles and nine triples while adding 17 stolen bases. On the mound Justin Traxler leads a solid staff which doesn’t post eye-popping numbers but does get outs when they need them. Calvin Bush, a pitching transfer from down-the-road Texas State and who was coached by former MLB star Calvin Schiraldi in high school, has the potential to be a breakout performer for the Tornados. The Jackets spent most of last season in the top 10, however, a disappointing second half of the season, in which they finished 11-10, put the kibosh on any extended postseason aspirations they may have had. R-MC will aim for more sustained success this season with reigning Old Dominion Athletic Conference Player of the Year Cole Migliorini back leading the offense and a trio of other everyday hitters who batted at least .340. The pitching looks formidable as well as four experienced, quality arms who threw at least 20 innings and had sub 3.30 ERAs return. After an unimpressive start to their season in 2017 when they had an even 13-13 record at the midway point, Babson had an extraordinary second half to establish a new school record for wins and earned the team’s first NCAA regional appearance. In regional play the upstart Beavers earned four wins and eliminated three before having their title hopes extinguished. It seems more is in store this spring as much of the roster that won 16 of their final 18 games is back in Babson Park. Offensively, there are few hitters more feared than Ryan Areana, who batted .331 and set the school record with 13 home runs and complied a meaty .682 slugging percentage. The starting pitching retains a trio of dependable, steady arms who together accrued nearly 50 percent of all innings pitched. Should they stay healthy head coach Matt Noone’s team could go far, very, very far. In order for the ‘Gulls to replicate last season’s success when they came within a win of reaching the D-III National Championships for the fourth time in seven years, they’ll need to somehow replace the production of the irreplaceable Pete Grasso who was one of D-III baseball’s top players both on the mound (9-1, 2.17) and at the plate (.381/.450/.608). The offense looks solid with a steady arsenal of bats back with four hitters who batted a combined .339, but the pitching staff looks to be a little more questionable. Each of SU’s top three statistical arms will be absent from this year’s roster which means head coach Troy Brohawn will need some of his incoming transfers and freshmen to be impact players early. Austin Heenan, who saw significant action on the mound as a VMI Keydet, is anticipated to play a vital role in the pitching staff’s renaissance. The Patriots spent the majority of last season in the top 10 as they steamrolled through their schedule while setting a school record for wins, but two quick setbacks in the West Regional snuffed their hopes of further fortune and glory. It’s a ‘good news, bad news’ scenario for the offense. Their top two hitters from last season are gone, but the rest of the gang is still together. Five players who batted at least .300 and started 20 games will be back in uniform. The same can be said for the pitching staff. Their ace from last season has moved on, but they can still tout Ryan Cheatham who wasn’t too shabby in his own right, earning a 3.33 ERA and perfect 9-0 record. A real difference maker for the team could be transfer Alex Masotto. Masotto played his first two seasons at nearby Tyler Junior College but went to Ball State for his junior season where his role was a spot pinch hitter and relief pitcher. He has the potential to be a presence both on the mound and at the plate. Head coach Eric Cirella’s Seahawk team had unprecedented success last season, capturing their second consecutive Commonwealth Coast Conference championship and earning the most single-season wins in school history to earn a national ranking for the first time. Back on the diamond are seven players who have earned All New England honors over the past two seasons, including Jimmy Fitzgerald, who struck out 73 batters in just 52 1/3 innings while only allowing 31 hits. The already solid lineup will get a boost from Tristian Dacey who hit .343 and led the CCC in home runs as a freshman but sat out all of last season. His presence gives the team a needed long ball threat in the middle of the lineup to drive in runs for the aggressive offense. The Raiders put together one of the most successful seasons in school history last season capturing the Ohio Athletic Conference regular season title and earning a Raider record 31 wins with their 28th victory being earned against national runner-up, Washington and Jefferson. Long-time head coach Paul Hesse should clear out some room in the school trophy case for what is setting up to be another record breaking year. The team has a pair of preseason All Americans in Billy Goodall and Phil Mary to lead a team that lost little from last spring. Goodall was the first Mount Union player to win the OAC Player of the Year honor after topping the conference with a .454 average and school record 25 stolen bases. Mary won the OAC Pitcher of the Year after compiling a 10-0 record with a 0.78 ERA. The Captains finished second in the CAC with a 15-3 conference record but dropped six of their last nine to have their season come to a disappointing close without an invite to the NCAA postseason. That shouldn’t be a problem this year as their dugout will look very similar with seven of nine everyday lineup slots able to be filled with experienced players. Additionally long-time Captain head coach John Harvell has three of four pitchers who started at least five games returning to the staff. While the team will be without two of the best statistical performers from last season, one at the plate and the other on the mound, their overall depth, experience and motivation from the postseason snub should more than make up for their absence. Willamette, a club without a single senior on the roster last season, was edged by Linfield in both the Northwest Conference regular season standings and the NWC tournament and will be looking to usurp their conference rival this season. Head coach Aaron Swick says his players are hungry, improved and healthy to make a run into the postseason after achieving Willamette’s highest winning percentage since 1998. Perry Van Echhardt and Connor Bailey top the well-stocked, experienced offense after batting a combined .342 with 33 extra-base hits between them. The speedy Van Echhardt also added 18 stolen bases. On the mound almost the entire roster is back in uniform, including every pitcher who started a single contest last spring. The staff ERA was a rather stout 4.46 last season, but their experience, coupled with added motivation and maturity, should drop that significantly this spring. After reloading following their 2016 national title, the Trinity Tigers will have the pieces in place to be a championship contender once again. Head coach Tim Scannell’s pitching staff looks particularly adept with a pair of seasoned starters in Kevin Flores and James Nittoli leading the way. The duo started 16 games, had a 2.05 ERA and held opposition to a .219 batting average between them. The team could get a big boost on the mound from Brendan Meyer, a former Sacramento State signee who has pro potential if he’s able to develop. The offense lost some primary producers but will be explosive at the plate and on the basepaths once again nonetheless with returners like Jake Martin and Rafe Chaumette, who earned All-SCAC honors last season. 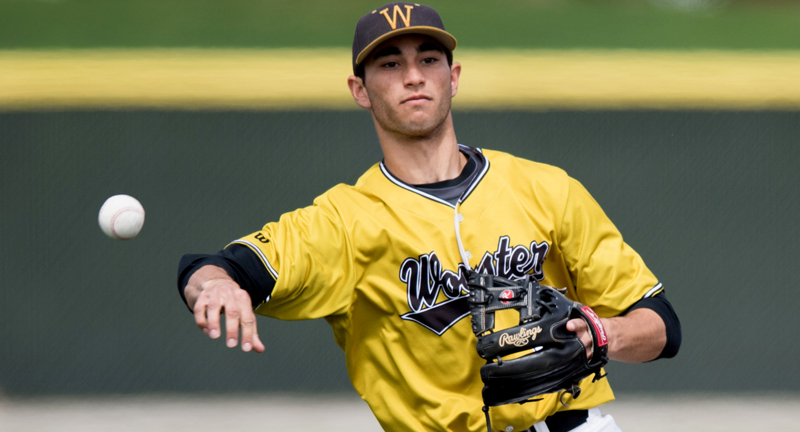 One of the biggest stories on the summer league front was the offensive production of Michael Wielansky, who attends the College of Wooster at the D-III level and set the Valley League ablaze with a .432 batting average. About 40 percent of Wielanksy’s hits went for extra bases this summer, showing that he wasn’t just a spray hitter. Playing shortstop for Wooster as a freshman, the Valley League Player of the Year’s future in professional baseball is likely at second base, however he still shows smooth actions and soft hands up the middle with the potential to be a strong defender at the position.